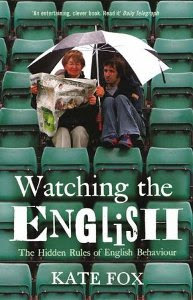 A bestseller in the UK, Watching the English is a biting, affectionate, insightful and often hilarious look English Society. Putting the English national character under her anthropological microscope, Fox finds a strange and fascinating culture, governed by complex sets of unspoken rules and bizarre codes of behavior. Through a mixture of anthropological analysis and her own unorthodox experiments-even using herself as a reluctant guinea-pig-Fox discovers what these unwritten codes tell us about Englishness. Although I'm born, bred and still living in Italy, I always felt out of place here and that I should have been born in England instead. I had attributed that to the fact that I am an anglophile who has always been fascinated by English history, culture, language and everything else about this country really, and thus hoping I would make a good Englishwoman myself, but after reading Watching the English by English anthropologist Kate Fox, it seems that I have quite a lot in common with the English after all. Maybe that's why I've always had such a strong and passionate interest for all things English. Fox has "a rather wimpish aversion to the dirt, dysentery, killer insects, ghastly food and primitive sanitation that characterize the mud-hut ‘tribal’ societies studied by my more intrepid colleagues", and so she has decided to conduct her research on her own people, the English. Her aim is to discover what it is that characterises the English, what are the unwritten rules that define their national character. In her quest to discover that, she conducts experiments which include breaking the rules, such as jumping the queue for instance, to see how those around her will react. Usually, not that well. She explores every aspect of Englishness, from speaking about the weather to sports, from food to clothing, from pets to holidays, from their sense of humour to work rules, to anything else you can think of, while also covering gender and class differences. So, what has Fox discovered? According to her, the English are affected by a social disease which causes them to become either very reserved and buttoned-up or loud and violent. Thus, English reservedness and English hooliganism are both sides of the same coin. Other aspects of Englishness are class consciousness (mixed with a sense of hypocrisy as they pretend not to care about such things), self-deprecating humour (they use irony to cope with everything), general moderation, modesty, fair play, politeness, the tendency to moan about absolutely everything and how they need rules and props to function socially (ie how they are bad at greetings and don't really know how to introduce themselves especially now that the "How do you do" expression used to break the ice has become outdated and hasn't been substituted with anything yet). As you progress, you'll find that at times the book gets a bit repetitive, but that's to be expected as the rules of Englishness pervade every aspect of their life and so, as each one is covered, you'll find the same "culprits" will pop up over and over again. But what makes the book such a wonderful read is the witty and funny writing style. The self-deprecating humour so typically English pervades all of it. Overall, this is a wonderful read for everyone who wants to understand better the English people. Now I wish we had a book like this for every country and every people! Watching The English by Kate Fox is a very funny, informative and enlightening book that explores the unwritten rules of Englishness to find out why the English behave the way the do. It is quite long and, at times, repetitive, but the witty and funny writing style makes it a very enjoyable read overall.